It was uncharacteristically warm when I made all of these. I love to get together with friends, and I felt a cookie party would be just the right party to have. 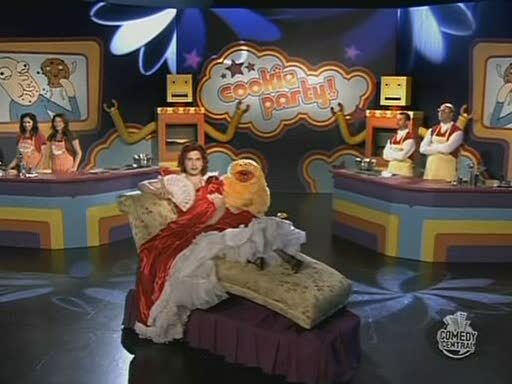 “Cookie Party” comes from the Sarah Silverman Program, where Sarah and her sister religiously watched the weekly cookie bake-off show. They even appeared on the show to make a batch of cookies against Mustang, these two jerks that give Sarah and her sister a rough time on Cookie Party. Here’s a still from the show. Here are those two Mustang jerks. My Cookie Party was only a friendly get-together with just about all 30 people making or buying some really good cookies. 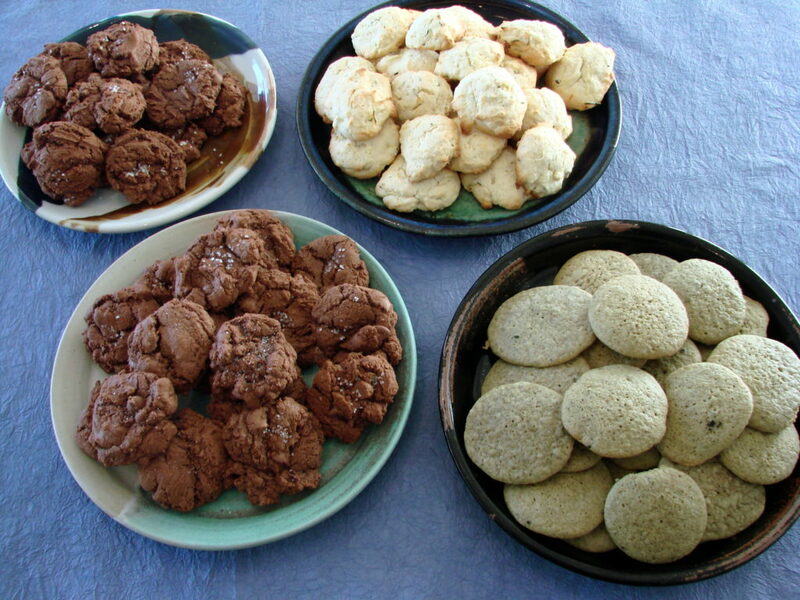 For my part, I made four types of cookies. You’ll find the recipes below. 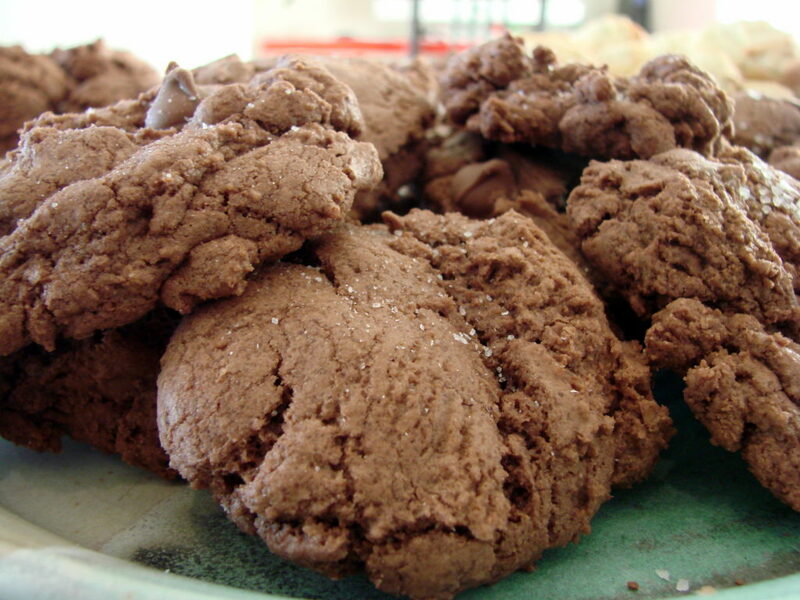 Taken from the Eating for England blog, these combine a perfect mix of sweet and salty. Heat oven to 325 degrees. Whisk together flour, cocoa powder, baking soda and salt; set aside. Melt 4 ounces coarsely chopped chocolate with the butter; let cool slightly. Put chocolate mixture, sugar, eggs, and vanilla in a bowl and mix until combined. Gradually mix in flour mixture. Fold in chocolate chunks. Using a 1 1/2-inch ice cream scoop, drop dough onto parchment-lined baking sheets, spacing 2 inches apart. Simply grind a little sea salt on each scoop of dough. Bake until cookies are flat and surfaces crack, about 15 minutes (cookies should be soft). Let cool on parchment on wire racks. This sweet and tart recipe was borrowed from Food52. Enough said. Add egg and mix until incorporated. Add lemon zest and zucchini; mix until fully combined. With the mixer on low, slowly add the flour mixture to the wet ingredients until all of the flour has been added and is completely combined. Do not over-beat. Drop by rounded teaspoons onto a prepared cookie sheet (I used parchment paper) and bake for 14-16 minutes, or until edges of cookie are golden. 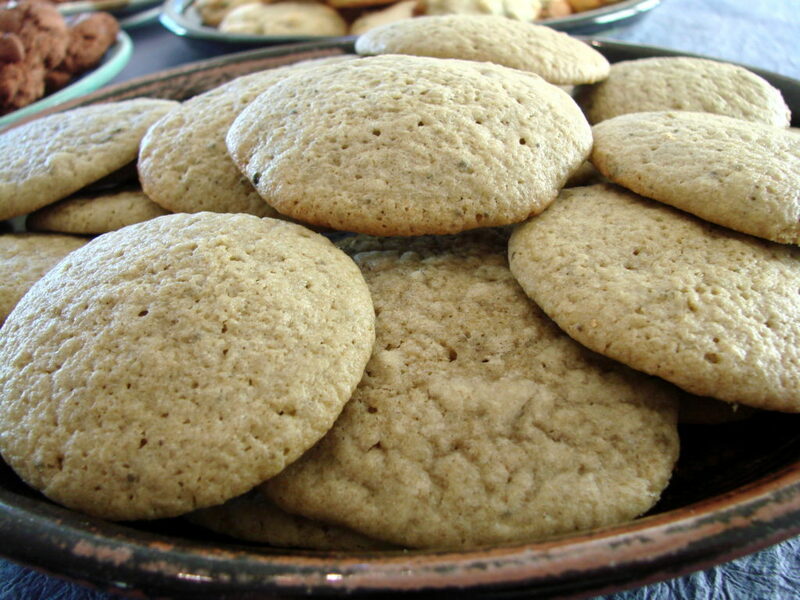 These sweet cookies have just a hint of green tea flavor. The recipe is borrowed from Ahu Eats. Cream together the butter and sugar in a large mixing bowl – it should be creamy colored and airy. A hand blender or stand mixer works well for this. This helps the cookie become fluffy and chewy. Gently incorporate the eggs, one at a time, to the butter mixture. Add the dry ingredients to the wet by adding a little at a time and folding or gently mixing the batter together. Keep going until you’ve incorporated all the remaining flour mixture. The dough should be a beautiful green color. Chill the dough for at least an hour – up to overnight. Roll the dough into balls the size of ping-pong balls and place them on a non-stick cookie sheet (or parchment paper). Bake for 12-15 minutes until the bottoms just start to become golden brown and the cookie no longer looks wet in the middle. Note: you can always bake them at 350 F for a less moist, fluffy cookie. It will bake faster by about 2-4 minutes 350 F so watch them closely. Remove from oven/cookie sheet and let cool on a rack. 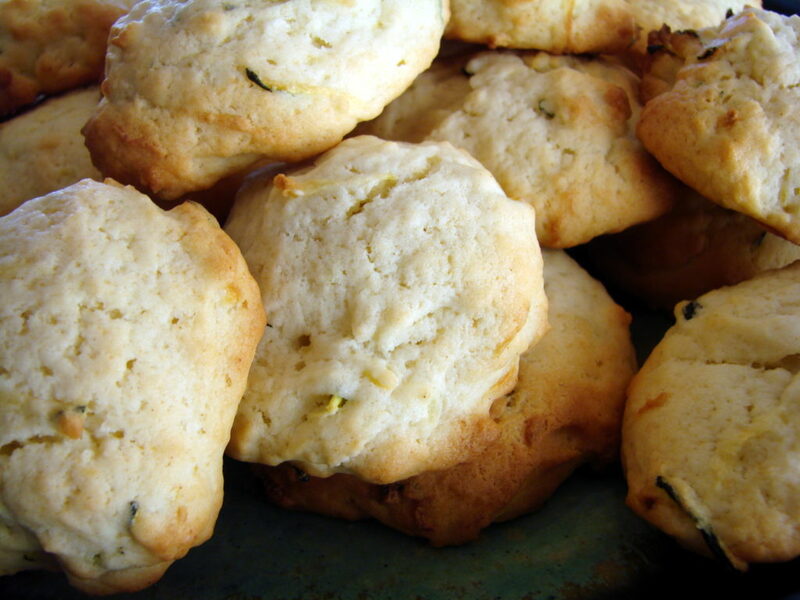 These were an even bigger hit than the zucchini cookies! I found this recipe on the Minimalist Baker. These are super-good and are the best gluten-free cookies I’ve had. Add sugar, brown sugar, vanilla, pumpkin puree (or applesauce), and beat for 1 minute. Mix until incorporated, being careful not to over-mix. Add almond milk and mix until a soft dough is formed. Switch to a wooden spoon if it gets too thick. If it appears to wet, mix in a bit more flour. Cover and freeze dough for 15 minutes, or refrigerate for 30-45 minutes or more. Five minutes before baking, heat your oven to 350 degrees F and position a rack in the center of the oven. Scoop out heaping 1T amounts of chilled dough and roll into balls. Alternatively, roll out between two pieces of wax paper, lightly flouring the bottom layer, remove top layer, and cut out shapes. Bake on the center rack for 10-12 minutes for (8-10 for cutout shapes), or until very slightly golden brown. Remove from oven and let rest on pan for a few minutes, then transfer to a cooling rack to cool completely. 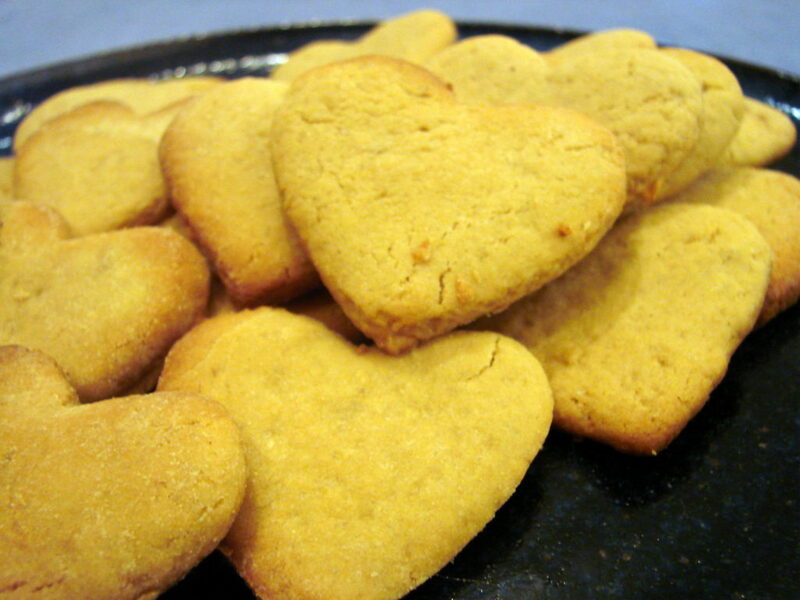 The heart shapes made them taste even better.